John Organ, current Division Chief of the Wildlife and Sport Fish Restoration Program for the U.S. 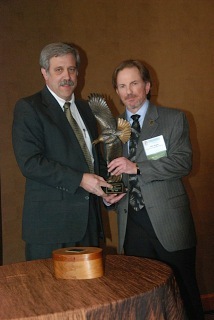 Fish and Wildlife Service Northeast Region and internationally respected biologist has received the Wildlife Management Institute’s 2014 George Bird Grinnell Memorial Award for Distinguished Service to Natural Resource Conservation. The award was conferred on Wednesday, March 12, during the 79th North American Wildlife and Natural Resources Conference in Denver, Colorado. Organ also has served as past president of The Wildlife Society and is a champion of the North American Model of Wildlife Conservation. Organ received his Ph.D. in wildlife biology from the University of Massachusetts, Amherst, where ne now serves as Adjunct Associate Professor of Wildlife Ecology and Conservation. He became the first-ever Assistant Regional Wetland Coordinator for the Service’s National Wetland Inventory program, where he attained extensive knowledge of wetland ecology and mapping and frequently acted as Regional Wetland Coordinator when called upon. During the course of his highly respected career, Organ has served as a Certified Wildlife Biologist, Fellow and Past President of The Wildlife Society, Professional Member of the Boone and Crockett Club, Senior Specialist in the Fulbright Scholarship Program, Permanent Invited Professor at the Universidad Andres Bello in Santiago, Chile, and supervisor of M.S. and Ph.D. students studying carnivore conservation and ecology in Canada, Chile, and the U.S.
To many in the profession, Organ’s seminal contribution to North American conservation has been his work to describe, advance, and promote the North American Model of Wildlife Conservation. He is considered by his peers to be perhaps the single most knowledgeable living professional who understands the history and heritage of wildlife conservation in North America.